Over the years the BattleTech Technical Read Out (TRO) books have been very popular. From what I understand the TRO books are one of the best selling lines of BattleTech books ever. Personally I've always liked them, but I found them to be more of a fun read than required reading, or must have gaming material. The latest TRO is based on the 3085 timeline, and it's truly one of the best TRO books they've ever produced. It also happens to carry the heftiest price tag of any TRO book as well at a whopping $39.99 USD. 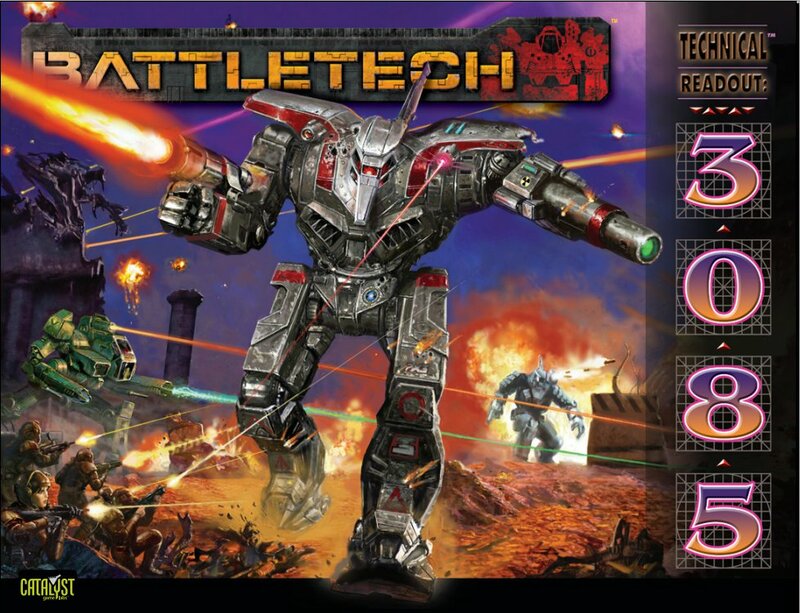 The Record Sheets (RS) 3085 is also one of the latest RS releases for BattleTech, which is a must for most any player looking to engage in BattleTech action in the much later years. Both TRO and RS 3085 include many of the Dark Age era models too, which is a plus if you ever played or appreciated the models from Wizkids Mechwarrior: Dark Age clix-based gaming system. As I started earlier, while this is clearly the most expensive TRO book they've ever released, it's for good reason. For instance TRO 3050 weighs in at 248 pages with a $34.99 price-tag, but TRO 3085 includes 300+ pages for $39.99 USD. I think $5 more for 50+ more pages is fair, especially once you see what's all included in the book. The book starts with a slew of credits and an intro. Then pages 8-127 covers the Inner Sphere units in amazing detail. From various Battle Armor suits, through vehicles and Mechs, there's so much to dig into. The Inner Sphere coverage concludes with Drop Ships even! Pages 128-187 details the Clan units in equally as impressive detail, also ending with Drop Ships. The next section is only a few pages and is called “The Old is the New New”, and it essentially goes over various upgrades and enhancements made to a variety of the existing systems throughout the game. Later pages 192-221 covers Infantry units in a section called Conventional Infantry, but on a House, Clan, Corporation and/or Mercenary faction level. That was definitely a good read. The last part of the book concentrates on Project Phoenix with sections for both Inner Sphere and Clans, and the last section is simply called LAMs. This last section is the part I personally found the most interesting, because I've always been intrigued by the LAMs. Being a big fan of all things Mecha, the Robotech design models, which are now called the “unseen” have always been some of my favorite models. The LAMs section includes all new totally original LAM designs for the existing “unseen” named LAMs. There's new entries for Shadow Hawk LAM, Stinger LAM, Wasp LAM and Phoenix Hawk LAM MK I models. What I really found interesting is that it's clear these new designs look like what you'd expect a modern Mecha model to look like, and it's clear a lot of inspiration is drawn from the Transformers feature films, and the current evolution of Mecha design overall. Lets face it, although the original “unseen” LAMs do look very cool, they still only look top of the line and high-tech for the late 1980s. In 2010 those old LAM designs are simply nostalgic more than cutting edge now. It's like looking at a 1985 Mustang GT and then at a 2010 Mustang GT. There's no getting around the fact that improvements in design occurred over a span of 25 actual years in real time, and they're bound to look radically different, yet the same in some ways. So it's nice to see that BattleTech has its own completely original LAM designs after all of these years that players can now use legally. They're radically different than the original “unseen” LAM models, but they're on par with the best Mecha designs you can find out there anywhere now in 2010 just the same. Of course what good is any Technical Read Out book without a Record Sheets booklet release to follow right? The RS 3085 package is a little more than the average Record Sheets release too. In the old days when you purchased Record Sheets, you pretty much got nothing but Record Sheets. There's a trend I'm seeing here, and that's Catalyst Game Labs has a habit of one upping the stuff they've done previously with almost every new release that they publish. In the beginning of the RS 3085 booklet you'll find a nicely outlined Rules Addendum section covering some Advanced Rules which are found in Tactical Operations and Strategic Operations core rulebooks, allowing you to play the units found within RS 3085 the way they were designed to be played essentially. There's also two unique scenarios provided, but what I find most exciting is that there's a set of Quick Start rules included for Land-Air BattleMechs (LAMs)! Remember those awesome new LAMs I was speaking off in the TRO 3085? Well the rules are now provided for how you can use them in the game in the RS 3085 booklet. So aside from 71 pre-printed record sheets covering most of the 3085 releases, RS 3085 includes a little bit more than record sheets alone, and RS 3085 is the new starting point for bringing LAM action back to the BattleTech universe. My only complaint is that the Shadow Hawk LAM from TRO 3085 isn't included in the RS 3085 booklet. 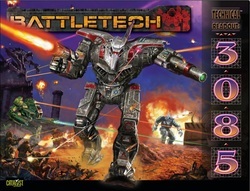 At just $9.99 RS 3085 is truly a must for any BattleTech player as well. As for 3085 as a whole, being I was a Mechwarrior Dark Age player years prior to diving into BattleTech, I really appreciate the 3085 era a little more than the average BattleTech player. I was really pleased to see so many of the Dark Age era Mechs and vehicles included in the TRO 3085 and RS 3085. For instance I now only wish they'd make a model of the AS7-K2 Atlas model from Dark Age, but it was nice to see it and other old favorites like the Hellstar, Sphinx. Shock Wave, Targe, Arbalest and Tundra Wolf Mechs listed in TRO and RS 3085. The TRO 3085 also really sets a new standard for TRO books. At 300+ pages there's a lot there to sink your teeth into, and the art is pretty amazing from cover to cover. The last few pages with the LAMs in various modes is also quite a sight. Now if only they'd release new models to match the new artwork. I also enjoyed the art of the various infantry units in TRO 3085, because the actual infantry models are so small that you can't really make out what they truly look like. It's nice to be able to finally see more of what all the various infantry units are supposed to look like in one place, all at once. While many of the models I'd personally like to see made from TRO 3085 aren't available yet, there are some very interesting new ones that have been released as recently as this week. For more on that stay tuned for my review of the Iron Wind Metals TRO 3085 Lance Pack model set. I should also mention that both TRO 3085 and RS 3085 are available in digital PDF format as well for $25 and $4.99 respectively.